I made this album over the christmas period for a lady who lost her mother before christmas. I wanted to make her something special that she could work at slowly to get her back into scrapping & this is what I came up with. I started off with plain chipboard for the covers, made a small frame for one (the front) & covered them with lots of layers of tissuepaper & PVA glue. I then painted the covers with Polished Pigments & when they were dry, distressed them with white lumiere paint which makes it look silver. 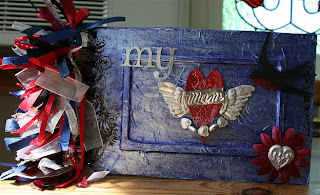 I then made the embellishments, the heart & bird were cut from chipboard & painted with lumiere paint & the heart had crackle medium applied to it. I made the wings & the heart in the middle of the flower using Delight & a mould, painted them white & sprayed them with silver Glimmer Mist & painted the heart shaped beads with my silver krylon pen. 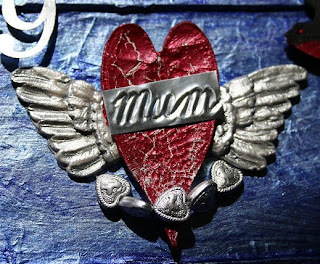 Lastly I used the krylon pen to colour the letters for "my" & freehand embossed (with my cruddy handwriting LOL) the word "Mum" into some metal shim I had & trimmed it down to fit on the heart. Added rubons to both edges. 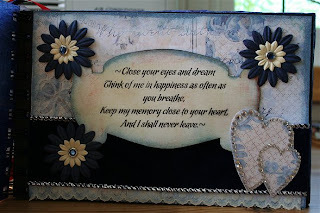 Next I made the title page using Basic Grey Periphery paper, blue & cream flowers, jewel brads, velvet ribbon, a Kaisercraft Heart & some card that I cut into shape, distressed with Distress ink & printed one of my favourite verses onto. 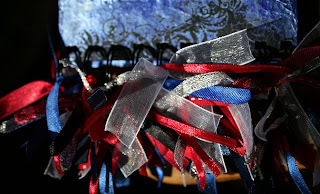 All it needed then was to be bound which I did with my Bind It All & ribbons tied on the binding. I was very pleased with the way it turned out, hope you enjoy looking at it. I thank you again Robyn with all my heart! I will treasure this album always! ((((((((((HUGS)))))))))) to you and Bless you! robyn that is such a beautiful little mini book. i am sure avie will treasure it forever. you are one very talented and generous lady. 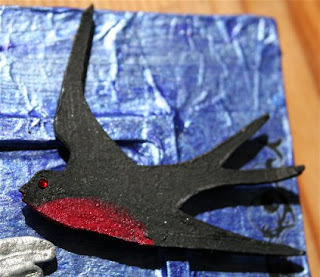 This mini album looks fantastic Robyn, and such a gift for Avie. You are so talented and thoughtful, a rare friend indeed. I love this quote too.